Synovial plica syndrome is a condition resulting from a remnant of fetal tissue in the knee. In early fetal development, the knee is separated into compartments by membranes called synovial plica. These plica diminish in size during the second trimester. In adults, the plica exists and are called “synovial folds,” or plica. In some people, the synovial plica is more prominent and prone to irritation. Because of the difficulty diagnosing synovial plica syndrome, it can often be a somewhat controversial diagnosis and an overlooked source of chronic knee pain. There are four plica synovial folds in the knee, but only one appears to be most problematic and this is called the medial plica. It attaches to the lower end of the knee cap and runs in a transverse sideways orientation to attach to the lower end of thigh bone or femur bone. If it becomes irritated over a long period by certain repetitive motions or kneeling, it can become inflamed, swollen and painful, leading to chronic knee pain. 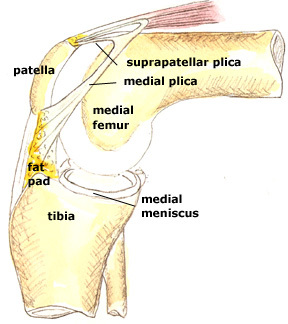 Occasionally, the medial patella plica can become thickened and trapped between the patella and the femur, causing painful clicking and locking. Although synovial plica syndrome can mimic a torn meniscus, it is rather an uncommon syndrome compared to a meniscal tear. Synovial plica syndrome is best treated by resting the knee joint and taking anti-inflammatory medications. These physical and sports medicine measures are usually sufficient to allow the inflammation to settle down. Occasionally, an injection of cortisone into the knee will be helpful. An innovative approach to treating an inflamed plica without arthroscopic surgery is through regenerative injection therapy, such as platelet-rich plasma (PRP). Platelet-rich plasma therapy captures the healing growth factors that are in a person’s own blood. By injecting the PRP into the inflamed area of the knee, it may help reduce inflammation and diminish pain, and the release of growth factors may promote the healing process without the invasive process of surgical intervention. Regardless of the interventional choice, therapeutic exercise is essential in the rehabilitation of the knee with plica syndrome. If you continue to suffer with chronic knee pain caused by synovial plica syndrome and your current treatment plan leaves you wanting more options, perhaps a fresh set of experienced eyes can change your outlook. Since 1990, Dennis M. Lox, M.D has applied his personal interests in sports medicine, cutting-edge regenerative medicine and chronic pain management to helping patients increase their quality of life. Contact us for an appointment at 727-462-5582.